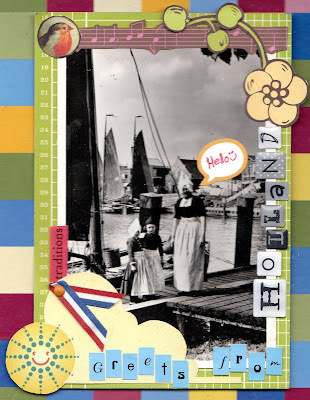 A Dutch postcrosser named Mirjam used a black-and-white postcard sent to her mother as a child in 1957 to create this wonderful greeting from Holland. What a great way to give new life to old cards! Thanks for sharing! Mrpotani made this card from a beer carton she deemed "too pretty to toss." Good timing, too. It arrived just as the yearly migrations are getting underway at nearby Hawk Mountain, a famed fly-by for migrating hawks. 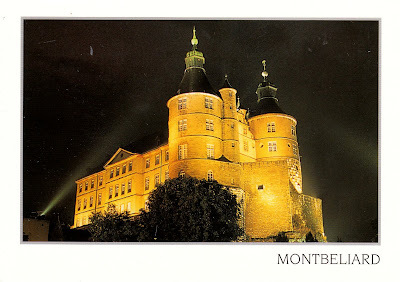 This is the first ever card sent by a new postcrosser, a 32-year-old father of daughters, who lives in northeastern France. He says his region is largely rural and has lots of forests and lots of cows. 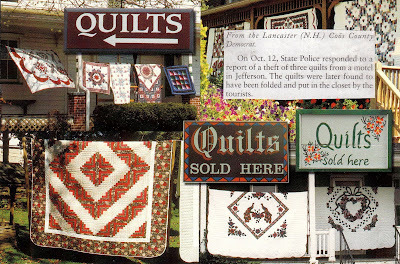 Sounds like Pennsylvania but we don't have chateaux. 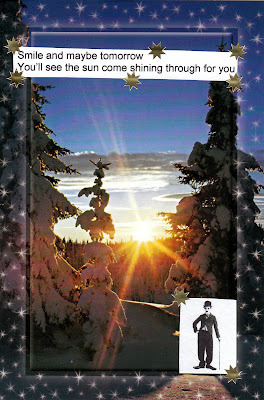 Here's a fabu submission for the "Year of Altered Postcards" from Angie in Australia. 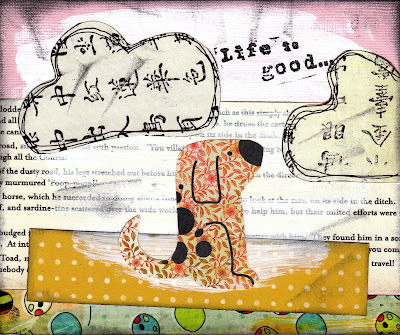 She writes that she just stamped letters over an ad card and turned it into a glad card. Thanks Angie! 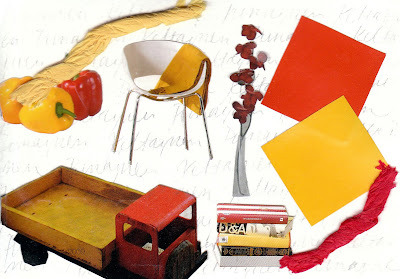 A Finnish postcrosser created this wonderful exercise in reds and yellows. It's a bit hard to see here but I love, too, how she covered the background in words. Fun, fun, fun! 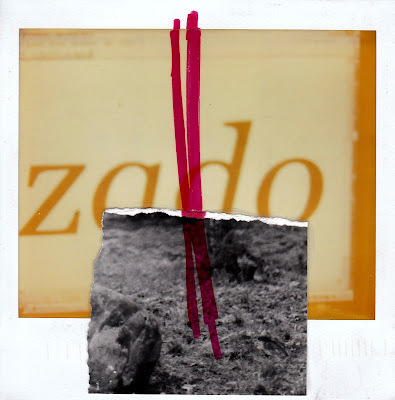 A Spanish postcrosser sent this excellent 'postcard', made from an altered Polaroid image. Two loves: Polaroid film, black & white film. 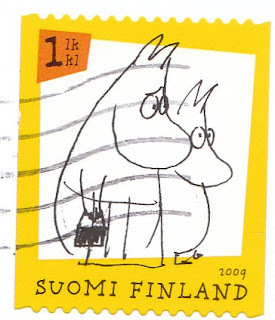 The card was sent as shown and rather amazingly arrived in pristine condition. Outstanding all around! 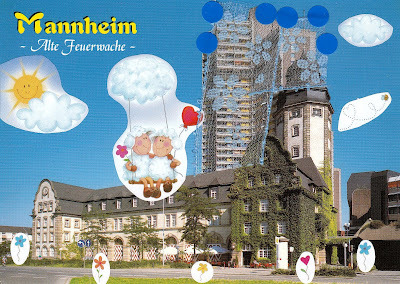 A German postcrosser altered this postcard which shows an old firehouse now used as a cultural center. She cleverly 'curtained' some offending blocks of flats built behind the center. Would that it were so easy to draw a veil over all architectural lapses. 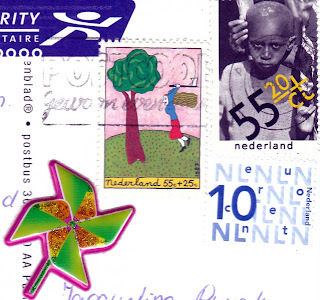 A Dutch postcrosser altered this iconic tulip with typical Dutch blue and white. Great image! A young postcrosser dreading the end of summer vacation sent this sweet harbinger of autumn. Given the stifling heat and humidity here, I'd take it in a moment. 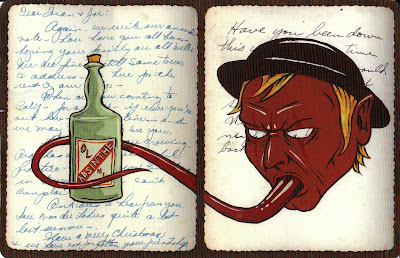 Artist Mike Shine has found a most intriguing use for old postcards, putting the message side front and center. 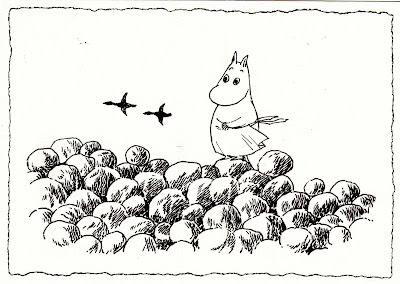 Mrpotani sent this postcard for Shine's current show, Flotsam's Wonder Tonic, at the Soap Gallery in San Francisco. 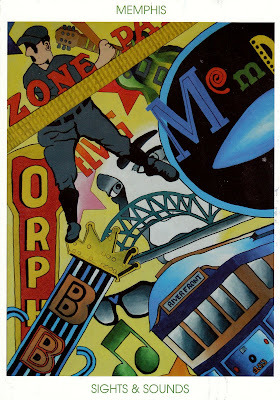 Lynn Berkowitz sent this cool card called Life in Memphis, by Irving Gabaldon of Kingsbury High School. 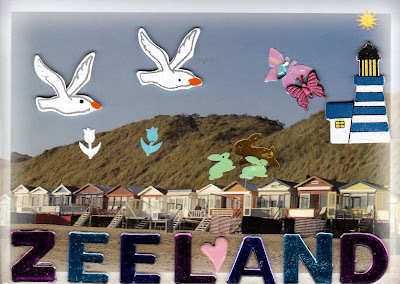 A Dutch postcrosser named Jackie sent this summery seaside altered card, done with lots of 3-D stickers. She writes that she likes to "go to the dunes, sit down, be very quiet and enjoy the rabbits, hares, and butterflies going from flower to flower", then "go to the beach and watch the seagulls, walk barefoot along the waterline, drink a cup of coffee, and go home." Ah, the good life. This bit from the New Yorker seemed destined for this card for a postcrosser somewhere out there in the world. 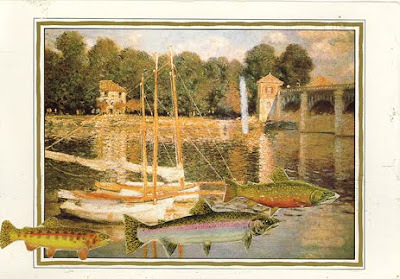 This card arrived from T. Hudgins of Apex, NC. She wrote that the card was something she had forever. She added the fish from an ad. I agree with her - they go very well together. She's a fellow blogger at www.knottyneedle.blogspot.com. Thanks so much!! 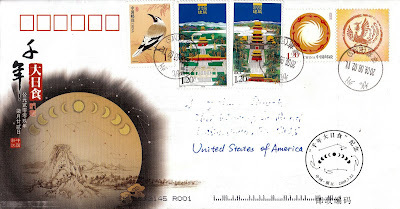 An 18-year-old postcrosser from Hangzhou who uses the name Evelyn saw the solar eclipse on July 22 and sent this fabulous cachet issued to commemorate it. 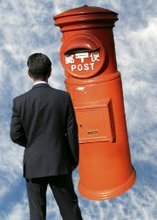 I was stunned when I fished the envelope out of the mailbox yesterday. 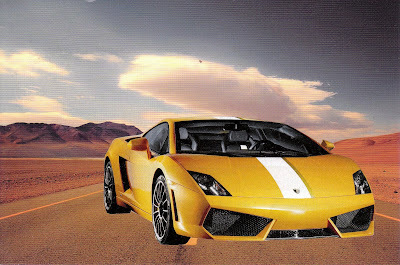 She also sent this card, which she altered with the addition of the Lamborghini. Maybe there's one in her future; she says that she loves movies and wants to be a director. Good luck to her! 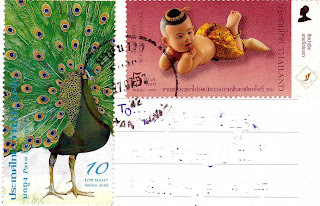 Some recent stamps from around the world. 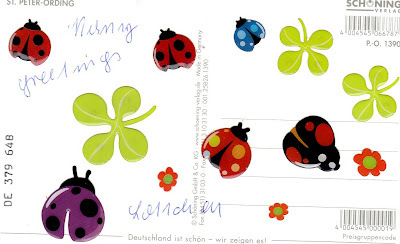 A German postcrosser altered the back of the postcard she sent of St. Peter-Ording with lots of good luck lady bugs and four-leaf clovers. She also sent a couple of very cool sheets of stickers! 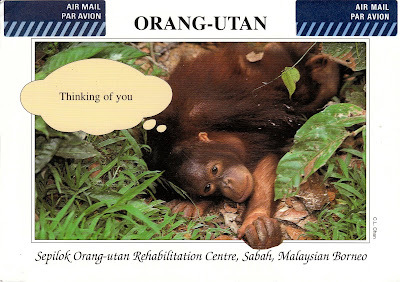 A Malaysian postcrosser named C. L. Chan sent this wonderful card from Borneo. He both took the photo and published the card. A professional photographer and amateur naturalist, he is the head of Natural History Publications (Borneo), which publishes books about the rich natural history of the region. He also has an elegant script. 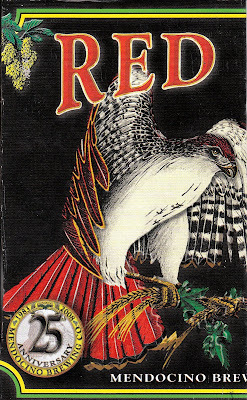 Click on www.nhpborneo.com to check out the book list. 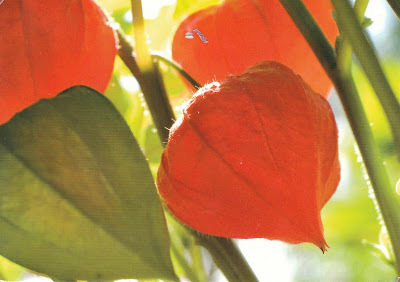 A Finnish postcrosser sent this vibrant view of Japanese (some call them Chinese) lanterns, one of my faves growing up. They used to grow wild here but not for many years now. 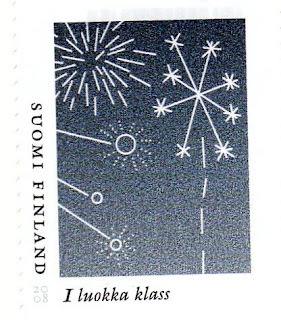 A Finnish postcrosser added lyrics from a famous song and a photo of the Great One to this dramatic view of a new day, then accented it all with more stars. Thanks! 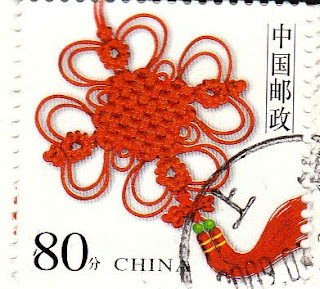 A Chinese postcrosser, and aspiring writer of children's literature, sent this altered card. 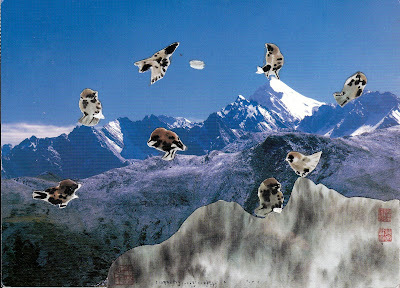 She added birds and other elements cut from a Chinese sumie card to this card of the Minshan Mountains and wrote that the meaning to her was that the smallest lives could still live, still struggle. in hard times, in an icy, cold place. They could still be full of hope. 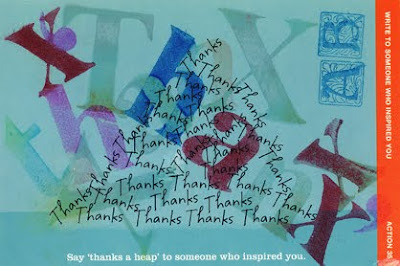 Many thanks to her for the card and the thoughts. 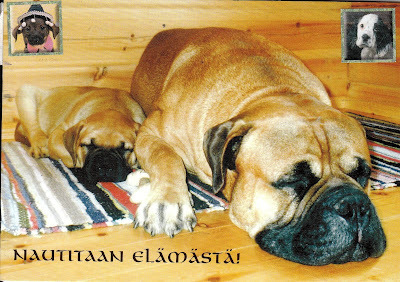 A Finnish dog lover, who has an amstaff and a staffy, sent this sweet card altered with stickers. She says that it reads, "Let's enjoy life!" 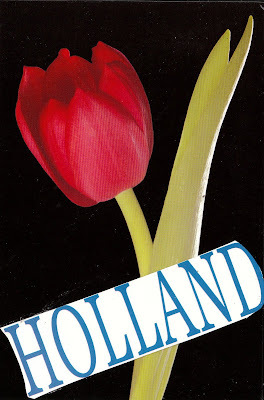 This cool card came from a Dutch postcrosser, who altered it in various ways. Thanks! It gave me a couple of ideas. 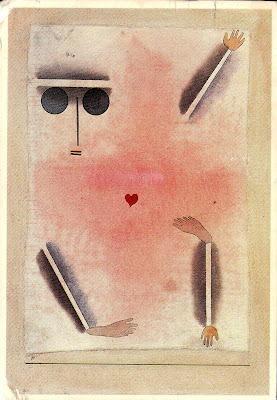 A Dutch postcrosser sent this wonderful Paul Klee card, which she picked up on a trip to Cyprus. 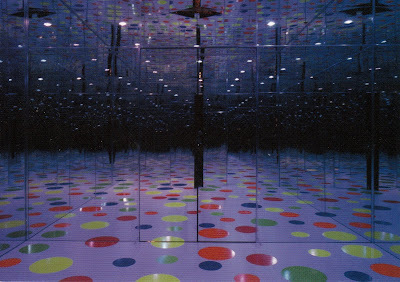 Friend Lynn B. sent this postcard of Yayoi Kusama's Infinite Dots Mirror Room at the Mattress Factory in Pittsburgh. What a treat, especially as I was there and saw it. 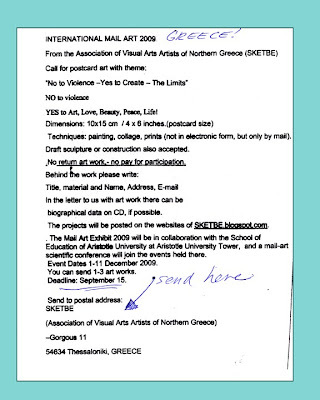 It all started with buying art postcards at museums. These two, waiting for me on my return from San Francisco, reminded me of that.